It doesn't look so prickly to touch ... yet. Probably just give it a while. Nice find, must be great to go where you may see snowy owls that would be a quality sighting. 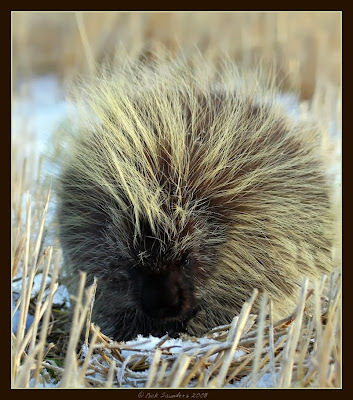 I've never seen a porcupine - isn't that strange? Pretty cool shot - sorry about the lack of snowy owls...maybe next time. I hope so, I'm anxious to see your pwl photos for this year. Thanks guys. Up until last year I'd only ever seen one Porcupine. P.S. I need to find out if we have snowy owls in Mich. I've always wanted to see one. Nice shot! Funny, it looks soft. You wouldn't think those things would be harmful. Your photos are so wonderful and these Porcupine pictures are so clear. I can't help but think of a Buffalo when I see the head shape in the close up. Can you see what I mean? Thanks Ann, yes I do see what you mean about the shape of that face. 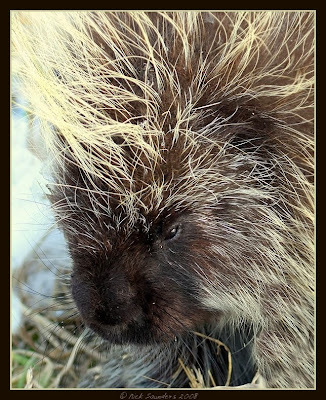 Often I think, the Porcupine is a very overlooked and fascinating creature. Great photographs. I've never seen a porcupine except in a zoo. Great photos. I remember years ago seeing a porcupine up in a pine tree so I climbed the tree and took some photos but I didn't get any this good. Cool - never saw one in the wild!